The Maytag Aircraft Building is significant as an exceptional example of Modern architecture in Colorado Springs. Contributing features include its folded plate roof, cantilevered walls, stacked, glazed brick wall cladding, tinted windows and use of an exterior courtyard as an integral part of the building. Designed by the local firm of Lusk and Wallace, the building is also historically significant for its association with the Maytag Aircraft Corporation of Lewis Maytag, Jr., serving as the company’s headquarters from 1957 through at least 1982. 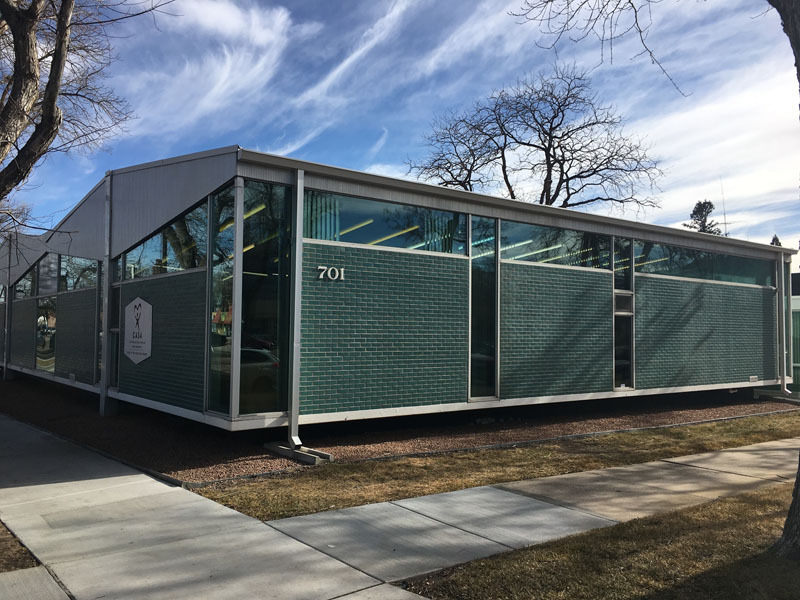 Jim Wallace’s Maytag building, constructed with aluminum, glass, and blue-glazed brick. Wallace is probably best known as the architect who designed the elegant Broadmoor Community Church. It’s a beautifully proportioned building like an aircraft has to be beautifully proportioned to fly, said architect Michael Collins who considers Wallace one of his primary mentors.